They were high school sweethearts who lived across the Mississippi River from each other. Yes, Jack and Judy Phillips were probably a 20th Century version of the characters from Mark Twain’s best seller, Tom Sawyer (Tom and Becky grew up on the Mississippi River). They moved to SunBird five years ago to enjoy a good active lifestyle where they no longer needed a snow shovel. After graduating high school, Jack joined the Navy, as he wanted to see the world; however, after finishing bootcamp, he and Judy got married in Iowa. Then he left to see the world. During his tour of duty, he made port in places like Japan and Australia with frequent stops in Vietnam (four times) he said. The couple had started what was to be the beginning of a beautiful life together (interrupted by a few years of military service). They were married in September 1966. While Jack was sailing his way around the oceans of the world, Judy was attending the University of Iowa where she was working on and completed a degree in radiology technology. So… Jack is out of the Navy starting work as a telephone technician, and Judy is working as a radiology technologist. Several years were spent living in Long Beach, California, then made a move to Denver, where an apartment fire ultimately chased them back to Iowa. The next adventure was parenting their two boys Mike and Troy. The parenting years were filled with many mini-adventures but in the end, the boys became adults and now have families of their own. Mike, the oldest son, and his wife Dana live in Iowa with their kids (Jordan, Zach and Kylie). Troy and his wife Kacey live in Telluride, Colorado, enjoying the high altitude, clean air and living the good life. Frequent trips to both locations keeps the family close. Three years ago, they added a new member to the Phillips family. Her name is Bella. She is a beautiful little girl (puppy) who will win your heart with her smile, charm and cunning. 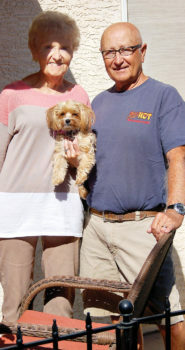 Bella is their three-year-old Yorkie-Poo and is the new boss at the Phillips house. In keeping with their active lifestyle, they started playing pickleball after moving to SunBird. They enjoy playing and love the social aspect of the game (made many new friends in the last five years). It also helps them to stay in shape. A typical week for the couple involves biking on Monday and Friday, pickleball on Tuesday and Thursday and hiking on Wednesday. Jack and Judy have cruised the Caribbean, the Mediterranean and up to Alaska. They have toured Europe and spent many hours lying on the beaches of Tahiti. While raising kids and living the good life in Iowa, Jack spent many weekends (over 20 years) on the Ski Patrol Team at Chestnut Mountain in Galena, Illinois. They are proud owners of a 24-foot Winnebago Mercedes and plan to continue travelling around the United States. Last year, they visited 10 national parks and are planning to continue the adventure this year.